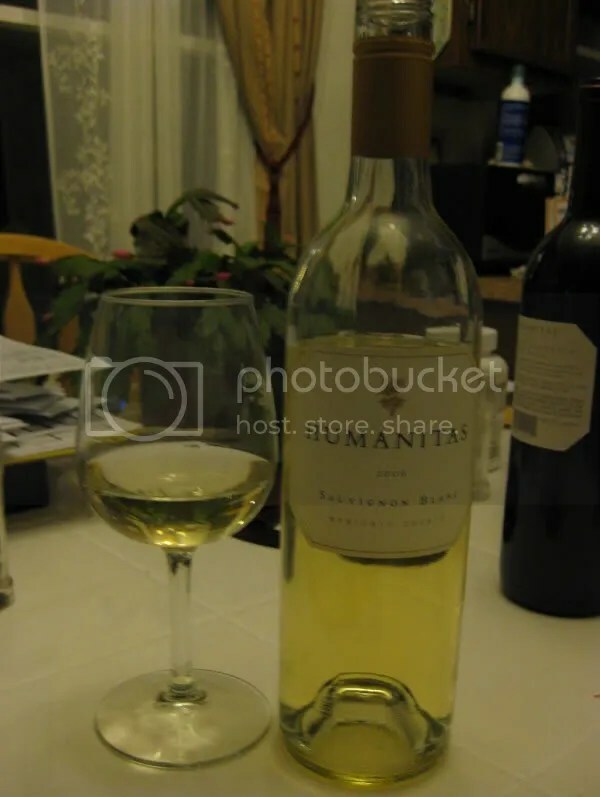 *Disclaimer: I received this wine as a sample from Humanitas Wines. While out visiting in Sonoma last month, we sadly crossed wires with Judd of Michel Schlumberger and weren’t able to visit at the winery. However, Judd had a bottle of wine he wanted me to try so he ran by Zin where we were dining with Russ and dropped off a bottle for me. The guys had already ordered flights of Zin and I was doing a tasting menu, otherwise, we would have opened it right then. Alas, it deserves its own examination, so I took it home to give it a proper tasting. 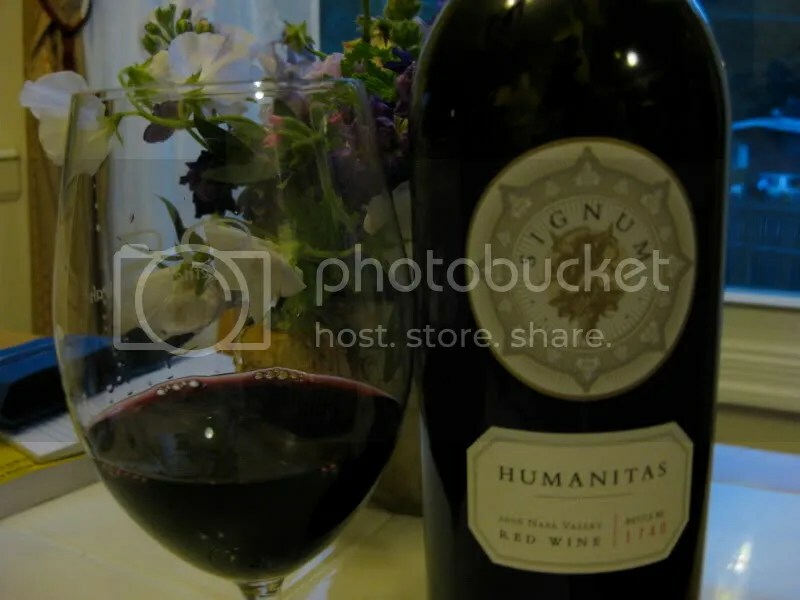 The wine is the 2006 Humanitas Signum, a red wine blend…each bottle is numbered, as only around 160 were produced. I have (had) bottle 1740. It had a plastic cork closure and clocked in at 14.8% alcohol by volume. On the nose I found plum, berries, spice, black currants, sage, black cherries, black fruit, nutmeg, chocolate, and brown sugar. An absolutely yummy nose, but it needed time to open up, this wine is a baby! In the mouth I got blackberries, black currants, black fruit, anise, spice, pepper, black cherry, plum, brown sugar, and some slight red berries peeking through on the edges. Overall, I know this has the potential to be a fabulous wine, but right now it’s young. I got to try this at the Wine Blogger Conference last year (and even snuck the remnants onto the bus in my purse) and on night two, just being stored under cork, this was knock your socks off good. Judd kindly passed the leftovers to me last year, and I didn’t want to share! I’d say give this one around 5 years and then taste it again. Definitely one for cellaring. *Disclaimer: I received this wine as a sample from Humanitas so I could participate in Twitter Taste Live. 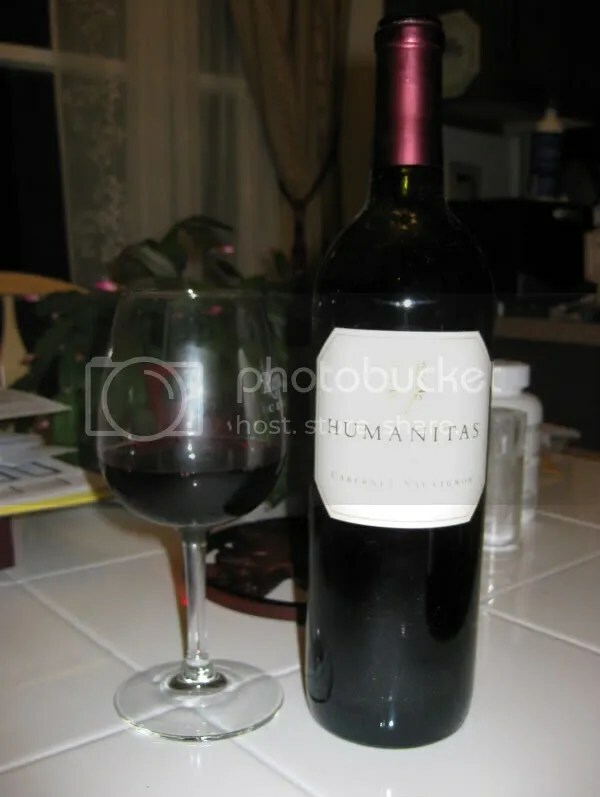 Up last for the evening of Twitter Taste Live was the 2006 Humanitas Cabernet Sauvignon from Paso Robles. It clocked in at 14.2% alcohol by volume, had a fake cork closure, and can be purchased for $20. A word to the wise: While this is an excellent wine, it really needs some time in a decanter. Probably a good two hours or more. I had our bottle open for about 3 hours before we tasted it, but not decanted, and it really wasn’t opening up. We stuck the cork in and saved it for the next night, and it definitely did better, but you could tell the flavors were still tight. So decant, decant, decant! As the title suggests, this wine showed dark as night in the glass, completely inky, and letting no light through at all! On the nose I found pepper, orange rind, lilac, berries, black berries, black currants, lots of spice, duty cocoa, earth, forest floor, nutmet, and blueberry. The wine had quite the enticing nose. In the mouth I got blueberry, blackberry, plum, spice, earth, leather, anise, black cherry, and chocolate. Overall, the wine had tannins to spare. It would be great with a grilled steak, as the tannins would marry nicely with the fat in the meat. At $20, this is an excellent value, and could hold its own well against much pricier Cabs. 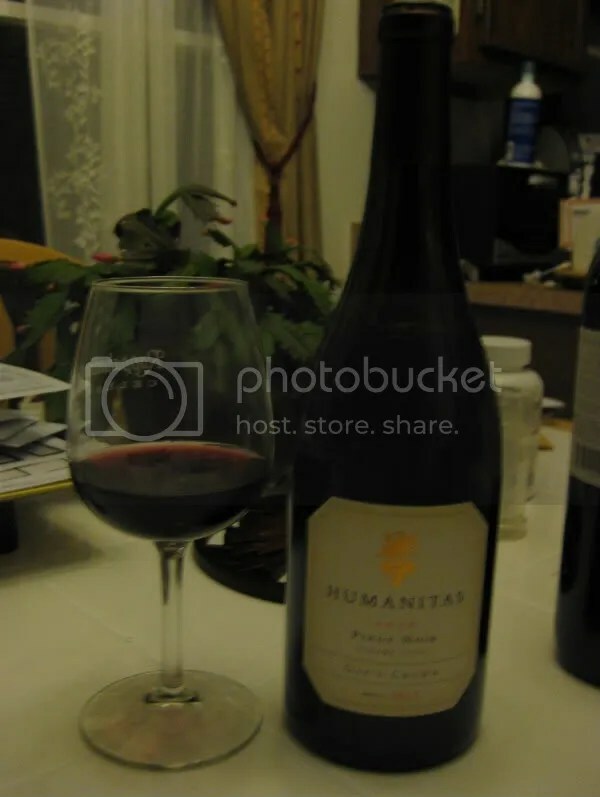 *Disclaimer: I received this wine as a sample from Humanitas to participate in Twitter Taste Live. 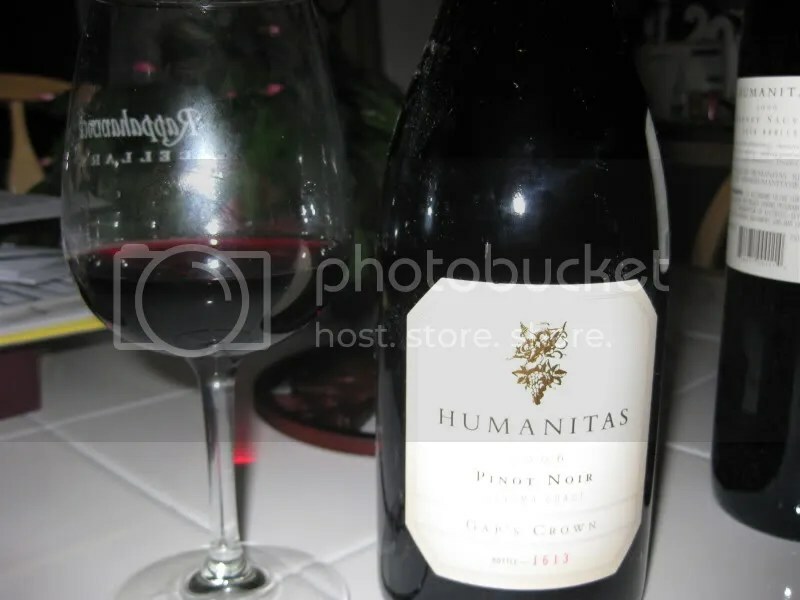 Of the four wines for Twitter Taste Live, the 2006 Humanitas “Gap’s Crown” Pinot Noir was by far my favorite. I loved everything about this wine. It hails from the Sonoma Coast, had a real cork closure, clocks in at 14.6% alcohol by volume, and can be purchased for $40. We kept this one under the Vacu-Vin and finished it 3 nights after Twitter Taste Live. It was even better the 3rd night, and that’s saying a lot, since it was delicious the first night!! On the nose I found chocolate syrup, cherry, oak, vanilla, black cherry, Coke, spice, cedar, chocolate, raspberry, and some anise. On first whiff, I really got the Coke…I don’t drink Coke, but Matt does, so I often pour it for him and know the smell well. Plus, I used to work in an ice cream shop and people would request Coke floats on occasion. In the mouth I found red fruit, raspberries, spice, leather, cranberry, pepper, and a really spicy finish!! Overall, I found the wine to have great structure, nice acidity, and some tannins to spare. I imagine this wouuld be an excellent one to stick away in your cellar for a few years, as it kept developing over the evening and showed even more complex flavors and aromas on night three. Or, unoaked as the case may be! 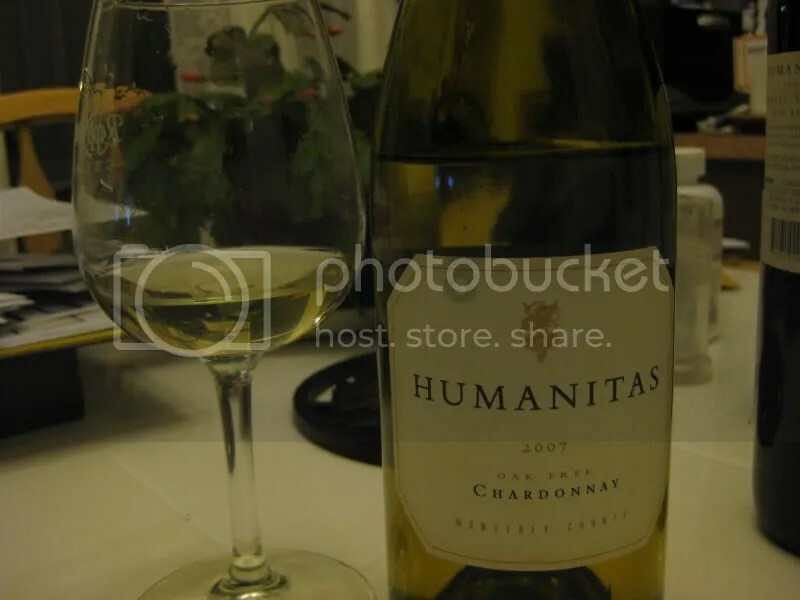 😉 The second wine up for Twitter Taste Live was the 2007 Humanitas Chardonnay. Although it’s unoaked, it’s allowed to sit on its lees for a bit, so it develops some of the creamy mouthfeel often associated with Chardonnay. The wine clocked in at 13.8% alcohol by volume, had a fake cork closure, and can be purchased for $18. On first sniff huge pear aromas dominated the nose. After I got past the pear, I found apple, cream, tropical fruit, passion fruit, guava, star fruit, and something kind of herbal coming through. In the mouth I found pear. Juicy pear. Really big pear flavors. I also got flavors of nuts and some tropical fruit, but overall, it really seemed like the pear overshadowed the other fruit. I loved the mouthfeel on this one. The wine was full and round, and being naked, the fruit showed through without any butter or oak getting in the way. We only managed to drink a taste of this on the night of Twitter Taste Live, and we stuck it back in the fridge for the next night, without doing anything other than putting the cork back in. It was absolutely perfect the second night. Great job on this one, and up there as one of our favorites of the tasting. 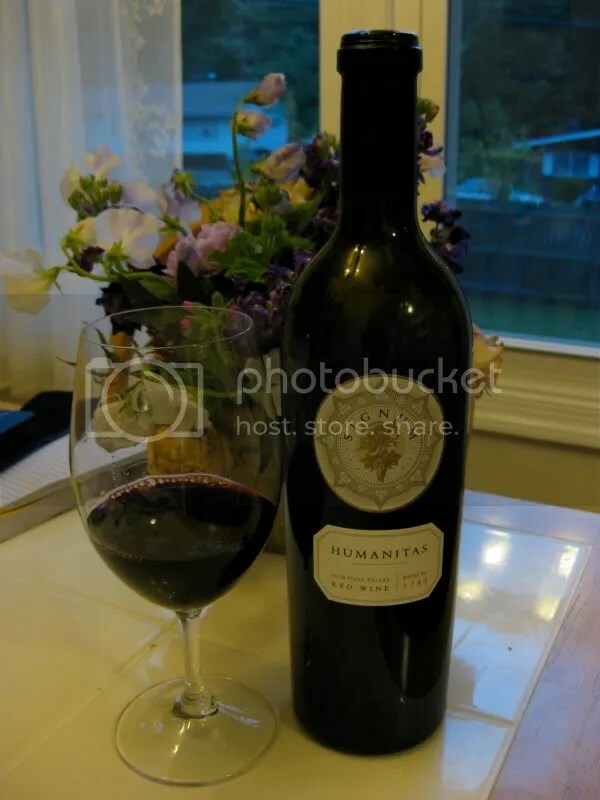 *Disclaimer: I received this as a sample from Humanitas so I could participate in Twitter Taste Live. 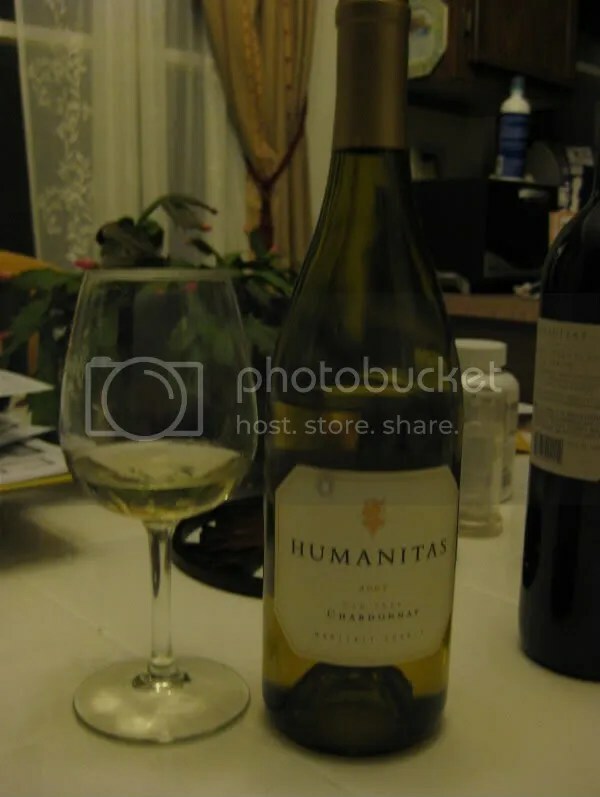 Up first for the most recent Twitter Taste Live was the 2006 Humanitas Sauvignon Blanc. 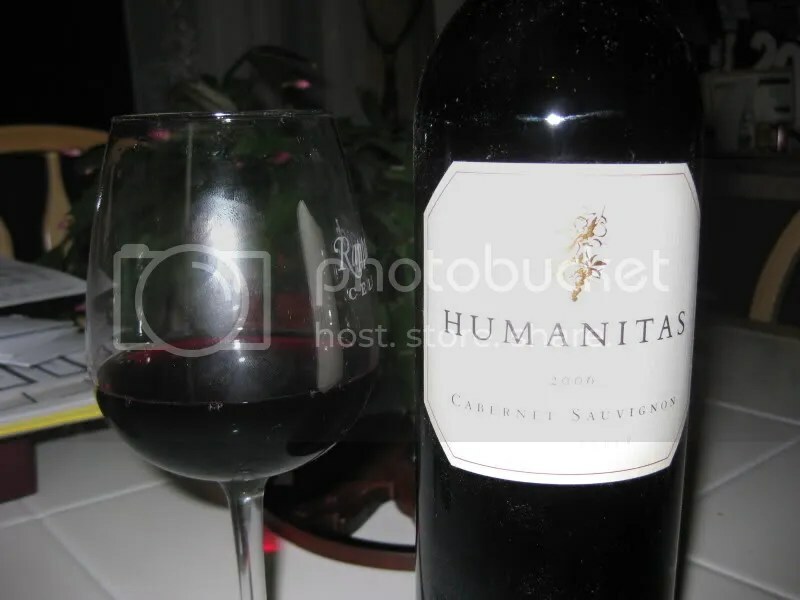 I’ve previously written about Humanitas and the charitable work done with the profits from all sales. 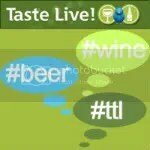 All profits from this Twitter Taste Live went straight to charity. If you haven’t joined in the fun yet, be sure to watch the website for the next event and order your wines early! 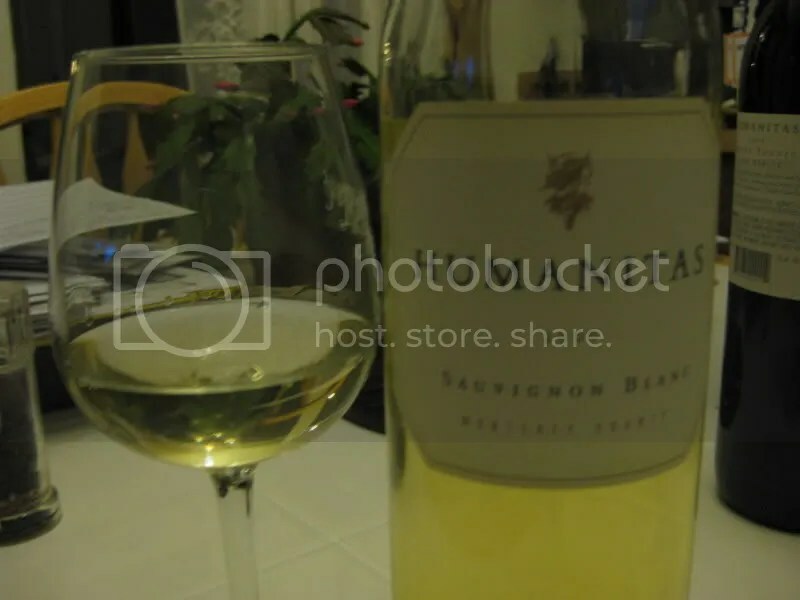 The Sauvignon Blanc clocked in at 13.8% alcohol by volume, had a screw cap closure, hails from Monterey, and can be purchased for $14. On the nose I found white peach, pear, apple as it warmed, grapefruit, grass, lemon, fresh cut grass, and Meyer lemon. I loved the nose on this wine! In the mouth I got flavors of lemon, peach, stone fruit, white pepper, grapefruit, nectarine, pineapple, and grass. I found the wine to be crisp, with a fresh, clean finish. I liked the tart fruit, and thought the wine was refreshing.